Los Angeles, CA (April 9, 2019) – Metro Goldwyn Mayer Pictures (MGM) announced today an all-encompassing merchandising program for The Addams Family with products inspired by the upcoming CGI animated film release from partners such as Cost Plus World Market, Funko, HarperCollins, Bioworld, Rubie’s Costume Company and more. MGM has secured over 30 global best-in-class partners across a variety of categories including apparel & accessories, costumes, party goods, collectible & toys, publishing, food and mobile gaming. The program will additionally be complimented by other select products celebrating the beloved television series. MGM released a teaser trailer for the animated comedy today. “The Addams Family is a cross generational family classic and MGM is fortunate to work with such incomparable brands that will help bring the film to new audiences. We are looking forward to establishing this as a Halloween perennial for years to come,” said Robert Marick, MGM’s Executive Vice President of Consumer Products. The Addams Family merchandising campaign will hit stores and online this September with a comprehensive portfolio of categories and exceptional licensees. The campaign includes costumes, accessories, and party goods from Rubie’s Costume Company; a wide variety of apparel and accessories for the young and young at heart from Bioworld, Fifth Sun and High Point; unique toys, collectible figurines and plush featuring both the film and classic television characters from Funko, NECA, Kid Robot, Mezco Toyz, Bradford Exchange and Sound n Light; a wide-ranging publishing program including children’s books,“making of,” gift and comic books from HarperCollins, Titan and IDW; themed baking, food and décor from Brand Castle; and unique gift & novelty items featuring both the film and classic television characters available only at Cost Plus World Market. In Australia and New Zealand, the licensed merchandise program will kick off in May with the release of The Addams Family classic Funko POP! 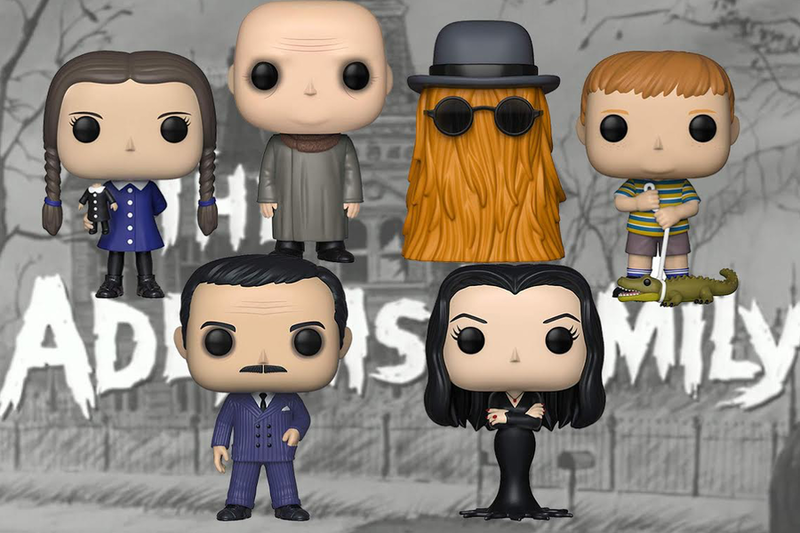 There are 6 characters to collect, as well as special editions, followed by the new Addams Family animated movie collection later in the year. Ikon Collectables will also bring us articulated figures, plush and collectables products from Kid Robot and Meczo Toys leading into Halloween 2019 and into 2020. Also onboard is Hunter Leisure, who will fill the amusement channels with plush in various sizes to tie in with the movie over summer holidays. Additional European licensees will augment the line in the region with unique apparel, costumes, and confectionary from Aykroyds, TVM Fashion Lab, RHSmith, Rose Marketing, Park Agencies, Ciao and My Other Me Fun.